HomeAll Posts...What is a Transcript? 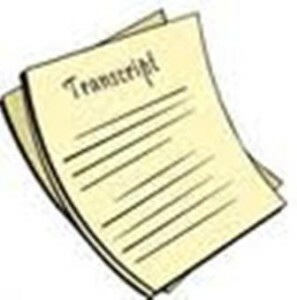 A transcript is a document originally in other medium. The transcript records the courses or subject successfully or not successfully completed by the student. It is an important document while applying for abroad education. The transcript transfers your actual academic score from one scale to different scale which is accepted by the university. Generally the grade cards and other documents issued by you are not accepted by the universities in abroad. So the transcript plays the medium which tells about your over all credits and scores during your undergraduate or post graduate program. There will two different transcripts for undergraduate course and post graduate course. To apply for this you must mention official transcript which is used in applying for jobs, admission to universities and internships in abroad universities. You will get your transcript from your current university. Different universities have different application system. Some ask you to do it online while some prefer if offline so be sure to check the procedure. Ask your university to give you sealed transcript. Some universities ask you sealed transcript while some ask you open one. So better to ask for sealed one because for those who want open one, you can open the seal easily. The transcript should be sealed in university envelope and the envelope must be signed across. Apply for more than necessary transcripts because some of them will also be needed while you apply for internships. The employer asks for your transcripts. You must apply for 8-10 transcripts. Have a scan copy of it ready. Some universities also ask you for it. And to be on safer side you must be equipped with scan copy of each document with you. Your university may also ask you for the name and address of the universities to which you are applying to write on the envelope in which they are sealed. So it is better to shortlist universities and have their names beforehand. Photocopies of your qualifying exams score card will be required. That to attest. Photo copies for your academic score card will be required. A formal application saying you are in need of transcript. State the purpose of transcript. The transcript process may require time up to 4 weeks so it is advisable to plan accordingly and apply for it in time. To apply to universities in abroad, the transcript is a must document. Without it you will not be able to apply to universities. So make sure you get them in time and apply for it accordingly. The transcript is a document verified and tested by the authorised person of university and thus has its high importance.